Mixers and agitators offer a unique problem for mechanical seals. Because most mixers or agitators are mounted on top or on the side of a vessel the long shaft being used to mix or agitate usually has an issue with run out. The longer the shaft the bigger the run-out. Mixer and agitator seals are similar to pump seals with one major exception, they are more prone to shaft runout. The reason is the generally long shaft extension that gives the shaft leverage against bearings and seals. One solution is to mount the seal faces in a fashion that allows run out. Our type 19 seal is unique in that the dual seal rotary seal faces run next to each other against a single stationary. This is a very unique design that permits far more runout than traditional single cartridge or double cartridge seals . 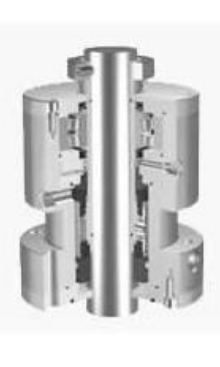 If the shaft is short or very well supported by ultiple bearings restriciting runout, a type 19 may not be necesssary. How much heat is being generated by the seal faces? The speed of the shaft and the materials of construction of the mechanical seal are of even greater importance than a flushed/lubricated seal. The best combination of seal faces is Carbon Vs. Silicon carbide due to the low friction generated between these two faces. Glass filled PTFFE faces are another potential solution.